Researchers at Okayama University show how mechanical stress at very early stages of bone development alters expression pattern of the non-collagenous matrix responsible for biological property of the bone. The bone matrix contains various proteins, namely, collagen and other non-collagenous proteins. Osteoblasts, are responsible for producing these materials. At early stages of development these osteoblasts differentiate and give rise to mature bone components. 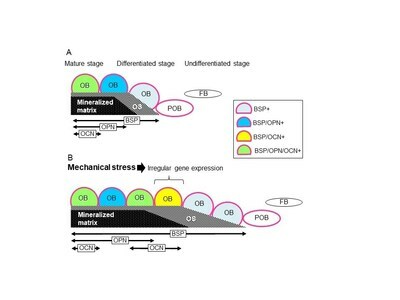 While the pattern of gene expression for the bone matrix protein in osteoblasts under normal conditions is known, the effects of mechanical stress on the process are unknown. Associate Professor Mika Ikegame from Okayama University have discovered an unusual gene expression pattern for the non-collagenous proteins in osteoblasts that is triggered by mechanical stretching. For their study, the team used parietal bones from the skulls of mice. The left and right parietal bones, attached in the middle by a suture, were carefully extracted from 4-day old infant mice; their skull bones were still in the developmental stages. These bones were then subjected to mechanical stretching by attaching each end to a spring. The spring tugged at the bones on either edge causing tension in the suture where new osteoblasts are developing. In the control group, the bones were connected to a spring without any stretching action. The set up was then left for 24 or 48 hours. Bone sialoprotein (BSP), osteopontin (OPN) and osteocalcin (OCN) are key non-collagenous proteins that play roles in bone formation and cellular activity. As the osteoblast develops and matures, it first produces BSP, then OPN and lastly OCN. Only late-stage mature osteoblasts will thus show OCN. The gene expression patterns of these three proteins were therefore examined in non-stretched versus stretched tissues to assess differences in developmental patterns. After 24 hours, the non-stretched tissues had little osteoid (non-mineralized bone) towards the middle suture, with mineralized, mature bone continuing outwards. BSP gene expression was detected in osteoblasts both on osteoid and mineralized bone, with lesser number of osteoblasts expressing OPN, especially towards the osteoid. This region also contained little to none osteoblasts expressing OCN, suggesting it was the least developed. The stretched sutures were widened, and contained a lot more osteoblasts producing new osteoid. BSP gene expression was still seen homogenously, and OPN and OCN were seen on mineralized bone, with a little level of OPN on the newly developed osteoid. By 48 hours, the new osteoid partially mineralized, and a lot more osteoblasts on the new bone matrix showed OPN and OCN, with some cells even showing OCN prior to OPN. This differential gene expression pattern shows that mechanical stretching not only increased differentiation of osteoblasts but also accelerated the expression of OCN. Given the fact that OCN can regulate energy metabolism outside of the bone, the authors conclude that this different pattern caused by mechanical stress might affect metabolic disorders, such as diabetes or hypercholesterolemia. Osteoblasts and osteoid: Osteoblasts are the cells found in the bone. They usually cluster and work together to produce the bone matrix. As osteoblasts mature, they produce osteoid which consist of type I collagen as a major structural component, and some functional non-collagenous proteins and some proteoglycans. Then, the osteoid undergoes mineralization and turns hard to form mature bone matrix. Differentiation: Differentiation is the biological process by which cells mature and develop. Differentiation gives cells enhanced features. For example, only differentiated osteoblasts can give rise to adult bone tissue. Mika Ikegame, Sadakazu Ejiri, Hirohiko Okamura. Expression of Noncollagenous Bone Matrix Proteins in Osteoblasts Stimulated by Mechanical Stretching in the Cranial Suture of Neonatal Mice. Journal of Histochemistry & Cytochemistry, 58, 2018. Associate Professor Mika Ikegame, D.D.S., Ph.D.
Okayama University is one of the largest comprehensive universities in Japan with roots going back to the Medical Training Place sponsored by the Lord of Okayama and established in 1870. Now with 1,300 faculty and 13,000 students, the University offers courses in specialties ranging from medicine and pharmacy to humanities and physical sciences. Okayama University is located in the heart of Japan approximately 3 hours west of Tokyo by Shinkansen.